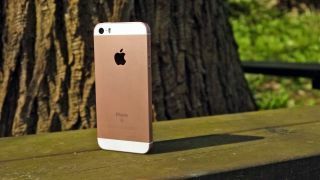 When the iPhone SE launched in 2016 it was the perfect palm-sized partner to the larger iPhone range, but three years later it still hasn't received a successor – this could be set to change later in 2019 though, as reports suggest Apple is working on one. A report, from PC Tablet, gives us details on the phone – apparently it will be called the iPhone XE and will launch in late 2019, alongside the iPhone 11 – but some of the information seems a little dubious. According to the report, the iPhone XE will launch with a small 4.8-inch AMOLED screen, broken by a chunky notch at the top that presumably houses a speaker and camera. There's no home button, as the device is to use Apple's Face ID. Is the iPhone 8 Plus the most modern affordable iPhone? On the rear there's supposedly a 12MP camera, so Apple is apparently sticking to the single-lens situation of the iPhone XR, but unlike that phone the iPhone XE isn't set to come with wireless charging. There are a few things about the report that seem a little unlikely, although nothing we'd necessarily call incorrect this far in advance. Firstly, the name XE seems a better fit to the current line of iPhone XS and XR – presumably if Apple were to launch this new phone alongside the iPhone 11 it would want to differentiate it in terms of name from the previous handsets. Secondly, the price stated in the report is $600-$800 (roughly £460-£610, AU$840-AU$1,120) – the iPhone SE was an affordable counterpart to the main iPhones, and this higher price point doesn't fit that target at all. That said, it could be that Apple is aiming to simply create a successor to the iPhone XR - which reportedly sold rather poorly - that takes inspiration from the iPhone SE's affordability while bringing some of Apple's latest tech. We won't know for a while, as Apple traditionally launches its phones near the end of the year, but stay tuned to TechRadar for all the latest Apple reviews, news and rumors.